Autonomous Single App Mode allows Zoom Rooms to run automatically and stay in the foreground of the device. If the iPad signs out from the Zoom Rooms, it will leave ASAM. If you are experiencing network issues, you can also leave ASAM to resolve them. Under Account Setup, toggle the Autonomous Single App Mode feature to on (blue). Note: You can also enable this for a location, floor, or individual room. Read more about changing settings based on location. 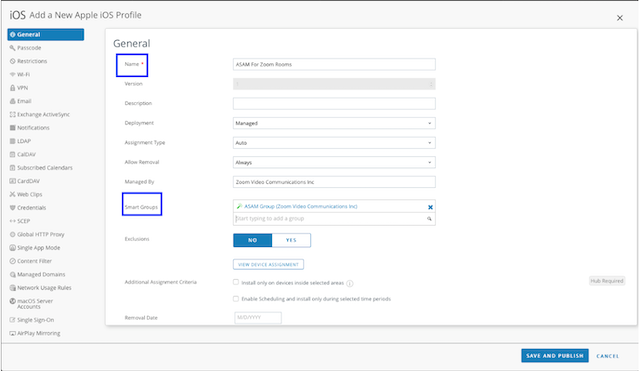 After enabling this setting on the web, you will need to configure the device in your MDM service. In your MDM service, add the key-value pair to the Restrictions Payload with the key autonomousSingleAppModePermittedAppIDs and the value us.zoom.zpcontroller. We recommend contacting Apple or your MDM service if you need assistance as every MDM may manage this differently. 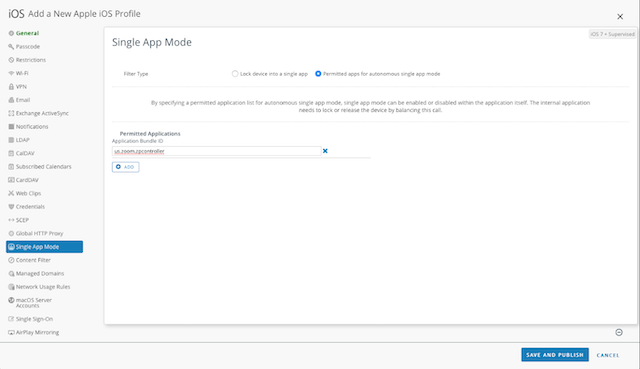 Follow the steps above to enable Autonomous Single App Mode in the Zoom web portal. 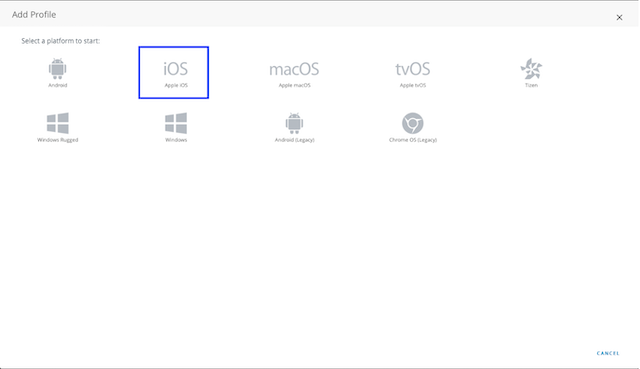 In AirWatch, navigate to Devices → Profile & Resources → Profiles. Click Add, then Add Profile. In the General tab, complete the following information. Other fields are optional. Name: Enter a descriptive name for your device. 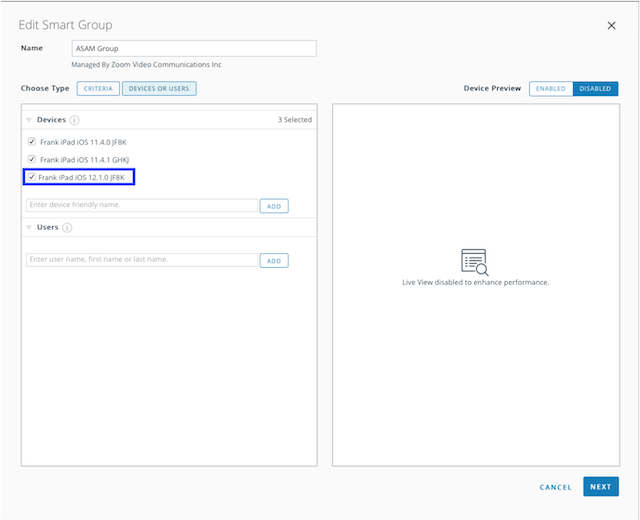 Smart Groups: Select an existing one or create a new one. The profile will be assigned to the devices in this smart group. Navigate to Single App Mode in the sidebar. Select the Filter Type, Permitted Apps for Autonomous Single App Mode. Fill the Permitted Applications Bundle ID with "us.zoom.zpcontroller". 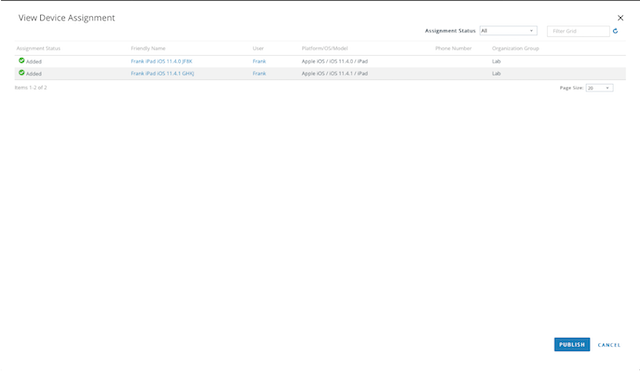 Navigate to View Device Assignment and click Publish. The profile will be installed to the above devices. 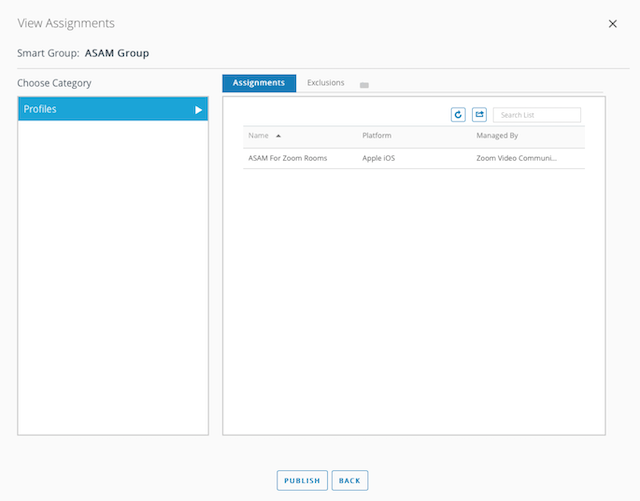 In AirWatch, navigate to Groups & Settings in the sidebar and select Assignment Groups. Click the group that is chosen when adding the profile. Add your devices to the group and click Next. Click Publish. The ASAM profile will be installed on the newly-enrolled device.